Swimmers from the masters squad frequently escape from Barnes to take on some bigger swims. Please send us pictures and news about any relevant events! 2016 BBQ MEET - SMUG MUGS! Placed 3rd LC 100 Free in a time of 1.10.14. (Her SC time at Sheffield October last year was 1.10.41). She also placed 2nd in the LC 50 Breast in a time of 41.97. 1.WORK. Give yourself 100% to whatever you are attempting. 2.DISPLINE. Discipline yourself to avoid the mistakes that hinder your development. 3.PRIDE. Once you possess a sense of work and discipline, pride is developed in yourself so that you know you are the best at what you do. 4.TEAM. The majority of your accomplishments are achieved as being part of a team. 5.SUCCESS. The degree of success that you achieve depends on how well you have mastered the other four concepts. Finally, let us not forget our own coaching staff here at BSC, who have encouraged Tania. Romily Hunt and Amanda Edwards. Romily, when Tania was a very young swimmer. Amanda, at her place of work at St Paul’s Girls School where Tania is an Assistant Teacher. 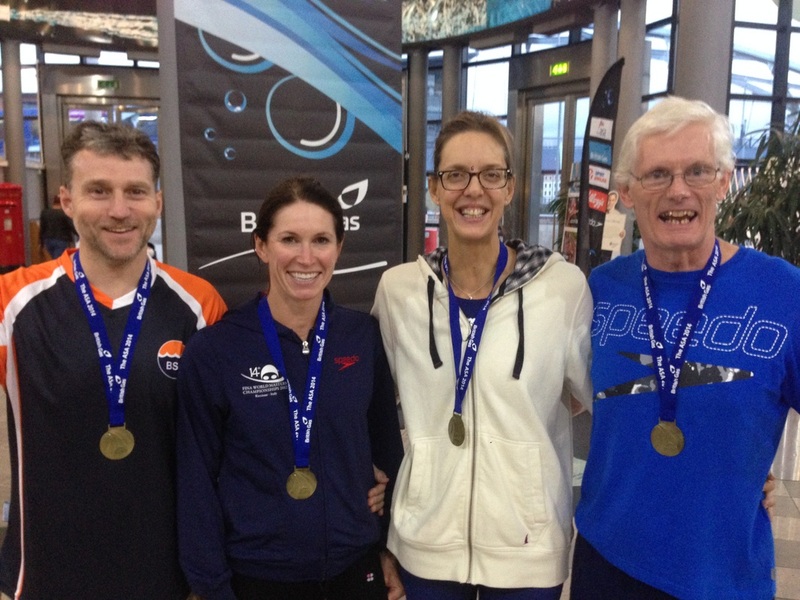 A BSC Masters Team of 16 swimmers travelled to Sheffield to compete in the 2014 ASA Masters Nationals at Sheffield. Albeit very strong opposition from up and down the country, we were up against cities in most instances, there were some tremendous team performances which displayed the real strength in depth of BSC with some 12 relay races being entered. See the photographs on club photos under club info page. Password will be emailed separately, but is the first 3 and last symbol/number from the aquatic centre door pass! Rebecca won gold in the 50m Backstroke and Tania achieving a life-time personal best in the 50m Free. David Brandon, Shelia Jansen, Bridget Trefgarne and Malcolm Munro. "TEAM – Together Each of us Achieve More"
Nicola Sutherland, Tim Donovan, Sebastion Young, Rebecca Newson, Tania Gordon, Ben Bradley, Andy Pryke, Rupert Trefgarne, Roz Sambrook-Smith, Dotty Laughran, Shelia Jansen, Bridget Trefgarne, David Brandon, Nick McChesney, Malcolm Munro and Tony Pearce. Tania Gordon, Rupert Trefgarne, Nick MacChesney and Tony Pearce followed up with not only acting in a reserve capacity but with some fine individual swims also. So, what was the real secret of our success? Very simply. Have Fun – Do what you love ……. In masters swimming fun comes from being honest with yourself. Swimming becomes fun when challenges are accepted and overcome. Swimming becomes fun when swimmers love the opportunities it provides, when they realize that they wouldn’t miss the swimming experience for anything. And above all else, swimming becomes fun when people face challenges and experiences together. Sharing work, success, failure and laughter will make any endeavor worthwhile. A day in the masters swimming world never goes by without allowing these special bonds to occur. Yes, you can win – and do all the things you love doing, whether that is raising a family or making a buck, while also achieving excellence in the pool. You need to be who you are. An obligation to be the best that you can be. The carousel (shown as a Dropbox thanks to Bridget Trefgarne) of photographs display what masters swimming is really all about. Happiness, pride and camaraderie. In other words, having fun. FUN – Finally Understanding Nothing. Chasing the Dream. Face the dream. Part of the dream may scare you but that’s O.K for that will bring out your motivation and inspiration. In other words who you really are and what you can do to make a real difference. Yes, chase the dream. Do it now. NOW – No other way. At present, our short-term goal is to compete in the 2015 European Masters Games at Nice with a view to our long-term goal of competing in the 2016 European Masters Championships at the London Aquatics Centre Olympic Park Pool. Details of both events are due to be published soon.